The Vinmetrica SC-100 is easy to use and gives precise results of free sulfur dioxide in red wine, with analysis time of less than two minutes per sample. Replicate analyses on the same sample are within 2-4 mg/L free SO2 . Cost of analysis is $1.37 per test all included, or $0.79 per test considering cost of reagent chemicals only. Sulfite, in the form of potassium metabisulfite (KMB), is used by commercial and home winemakers to prevent spoilage of the wine before and after bottling. When KMB is added to wine or must, sulfur dioxide gas (SO2) is produced. The amount of free SO2 released by any given quantity of KMB is pH dependent (more SO2 at lower pH). It is SO2 which is the actual antimicrobial agent. SO2 is a gas in solution; it is vented to the atmosphere during fermentation or racking. SO2 is reactive and binds to phenols and other constituents in the wine. For these reasons, the level of sulfur dioxide varies over the processing cycle and must be regularly checked: after fermentation, before malolactic fermentation, after each racking, and just before bottling. Under-dosage may result in spoilage; over-dosage may produce off-flavors in the wine, and some individuals are sensitive to high levels of SO2 . http://www.bcawa.ca/winemaking/so2use.htm, or on this link: http://www.practicalwinery.com/janfeb09/page1.htm. The usual method used by home winemakers is some variant of the Ripper Method. A good review of the Ripper Method can be found in this link http://www.mbhes.com/so2_in_wine.htm . 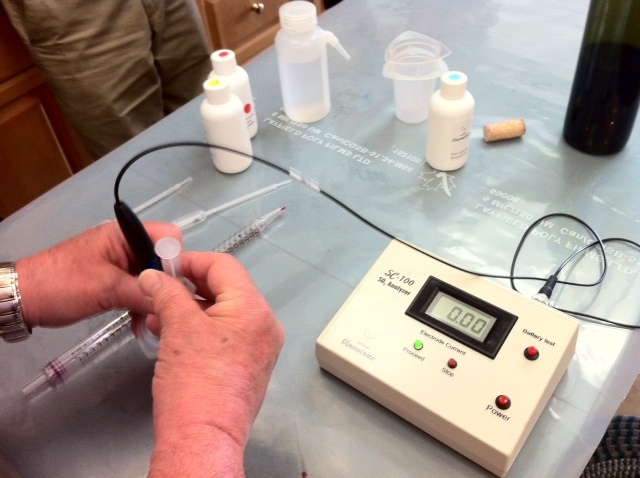 “Sulfikit” is a popular kit for free sulfur dioxide determination by home winemakers but it involves a titration to a blue endpoint which is difficult to detect in red wine even when the sample is diluted with water. Hanna makes an automatic titrator based on Ripper, model HI84100. 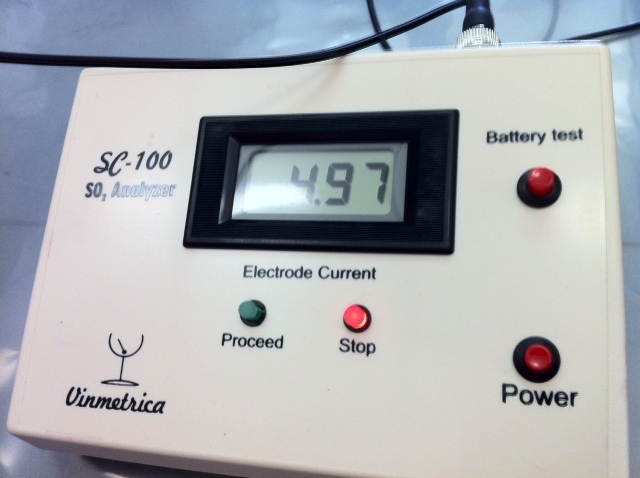 The endpoint is detected amperometrically (change in electrical conductivity of the wine). At a cost of $775, this technology is unavailable to the average home winemaker. The Vinmetrica SC-100 is also based on the Ripper method and uses amperometric detection. However, by replacing the automated titrator with manual titration, it is offered at a lower price compared to the Hanna instrument. Vinmetrica was founded in December of 2009 by Dr. Richard Sportsman. Dr. Sportsman was Vice President of Reagents and Assays at Molecular Devices Corporation from 2002 to 2008. He has a Ph.D in analytical chemistry from the University of Arizona. He is also an amateur vintner. Information about Vinmetrica and the SC-100 can be found at http://vinmetrica.com. Reagent set including Acid Reagent, Reactant Solution, and Titrant. One set is good for 50 tests. Two polyethylene transfer pipets for dispensing the acid reagent and reactant. One 25 mL serological pipette for measuring the wine sample. A Nalgene wash bottle for rinsing the electrode with distilled water is required but not included in the kit. The two reagents and the titrant supplied with the instrument, are proprietary and need to be reordered from Vinmetrica or its dealers. Dr. Sportsman advised me that the chemicals have a shelf life of at least one year, and may be refrigerated to extend the shelf life. The electrode tip has two platinum wires protected by a shroud. The electrode is stored dry. The instrument is easy to learn and use. However, instructions must be followed exactly; the titration must be completed within two minutes. The two criteria important to any test method are: precision and accuracy. Precision means the variation between results obtained on repeated analyses of the same sample. Accuracy means the difference between the analytical result and the true value. Precision was evaluated in tests on bottled 2011 malbec/syrah. Free SO2 was measured in triplicate. Then, 0.6 mL of 10% KMB was added to the bottle and left to rest for 30 minutes before again testing in triplicate. Finally, another 0.5 mL was added, and tested in triplicate after 30 minutes rest. Accuracy is generally measured by spiking a sample with a known quantity of a standard reference material. This is not practical for KMB and free sulfur dioxide. Dr. Sportsman provided a report describing results from independent laboratories showing good correlation between the SC-100 and other methods such as aeration/oxidation and Segmented Flow Analysis. The SC-100 may be ordered on-line from Vinmetrica’s website. It is also available from Vines to Vintages Inc. of Jordan, Ontario (www.vinestovintages.ca) for $265 plus $22.45 for shipping, total cost $287.45. If the purchase cost is amortized over ten years, the annual cost of ownership is $28.47. After the first year, a replacement set of reagents, good for 50 tests, must be purchased at $39.95. The net cost for 50 sulfite tests per year is therefore 28.47 + 39.95 = $68.42, or $1.37 per test. In comparison, the Sulfikit is available locally for $29.95 for 50 tests, or $0.60 per test. In 2012 I will purchase 700 lbs of grapes resulting in 7 carboys or 171 litres of wine or 228 bottles. Therefore, sulfite testing will increase my cost per bottle by $68.42 divided by 228 bottles or 30 cents. In comparison, my total cost per bottle in 2011 including grapes, ingredients, lab supplies, packaging material, and equipment depreciation was $5.75. Therefore, sulfite testing using SC-100 adds about 5% to my per bottle cost. I have decided the cost is justified by the added level of quality assurance for my wines.